I really enjoyed making this card. 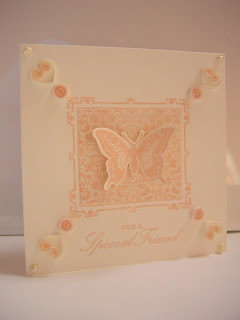 I stamped the frame in the centre of the card. On a separate piece of card I stamped the floral pattern (I stamped it twice to fill the area), I glued this inside the frame. 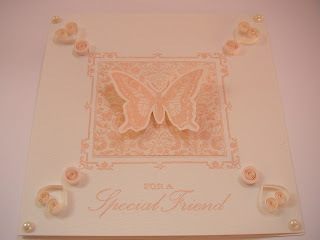 I stamped the butterfly on a piece of card and cut it out, I folded the wings slightly to give a 3D effect. I put a piece of foam behind the butterfly's body and glued it into the centre of the frame. I stamped the text beneath the frame. 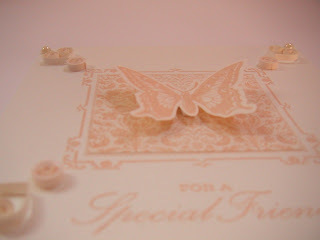 I then quilled 4 circles and 4 hearts from cream paper, I carefully glued these in place (a tweezers is handy for this). I finished the four corners with half pearls. All the stamps I used were Anna Griffin In the Garden.